If you were to give a birth date of watchmaking Peak Range, this would coincide with the birth of Blancpain, the oldest watch manufacture of world-views. Since 1735, in fact, the prestigious house of the Jura Valley, produces watches with the same care of then. Surrounded by greenery, in the bucolic setting of Le Brassus, in Val de Joux, Blancpain’s farm we find no trace of modern assembly lines. It is one of the rare cases where the watchmakers continue to assemble a clock from beginning to end. For nearly three centuries, Blancpain watches are individual creations, and as such reflect the personality of the watchmaker who builds them. Each timepiece Blancpain requires many handmade details, performed meticulously by hand. 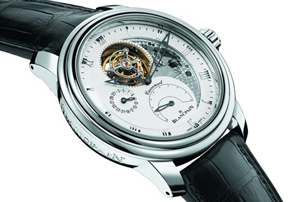 The uniqueness of each of these watches is derived from the technical choices and its reliability, but also from the finish, which are a distinctive feature of Haute Horlogerie. Finishing techniques and decoration are the result of a tradition and know-how that is centuries old, combined with a tradition of avant-garde. Blancpain artisans create their finishes with the use of stones, lime, and burnishers of abrasive papers, even on the parts that remain hidden to the eye. No machine can in fact compete with the precision of a “chamfering” (the sanding of the corners of bridges and plattine, but also of many other components), performed only by hand, under the lens of a master watchmaker wise. This philosophy has led Blancpain to hold an incredible number of world records, some really amazing, who dedicated Watchmaking History. The first automatic watch of History, in fact, in 1926, was built by Blancpain for Hardwood, and has radically changed the course of this art. Not only that, but it is the Blancpain watch is unique in the world more complicated, the Calibre 1735, tourbillon, with split-seconds chronograph, perpetual calendar, minute repeater and, of course (! ), Automatic, all within a diameter of mm. 35.9, and a thickness of only 12.15 mm. Alo find space inside 740 components and 44 rubies. His reserve, despite all the complications, comes to be more than double that of an ordinary automatic “time only”, reaching 80 hours of operation. This is just one example of the many capabilities of Blancpain, estrinsecate in as many world records.